This badge was issued to Tomohisa Ishikawa on 10 Jul 2018. 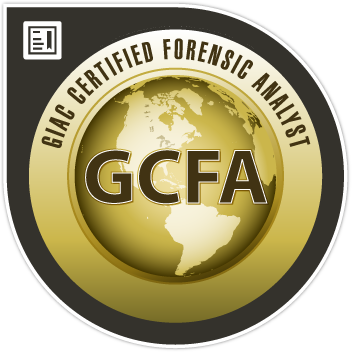 GCFA holders have demonstrated the knowledge, skills, and ability to conduct formal incident investigations and handle advanced incident handling scenarios, including internal and external data breach intrusions, advanced persistent threats, anti-forensic techniques used by attackers, and complex digital forensic cases. Professionals holding the GCFA are qualified to work in the information security, computer forensics, and incident response fields.